Guest Column: How Partisan are Texas House Members? Who are the most liberal and conservative members of the Texas House? Mark Jones, chair of the political science department at Rice University, breaks it down with his 2011 analysis. Political scientists have long used roll call votes cast by members of the U.S. Congress to plot the legislators on the Liberal-Conservative dimension along which most legislative politics in our nation’s capitol (as well as in Austin) now take place. Here, drawing on all 999 non-lopsided roll call votes held during the combined 2011 regular and first special legislative sessions, I provide similar information for the members of the Texas House of Representatives, using a Bayesian estimation procedure (IDEAL) developed by Stanford University professor Simon Jackman. In addition to plotting each representative’s specific location on the Liberal-Conservative dimension (Lib-Con Score, rounded to two decimal points, ranging here from the Liberal extreme of -1.10 to the Conservative extreme of 0.84), I also include the 95% credible interval (CI) for this point estimate. Only when a representative’s CI does not overlap with that of another representative can we say with any real certainty that their respective locations on the Liberal-Conservative dimension are credibly distinct. Three figures (All Representatives, Republicans Only, Democrats Only) with each representative's location on the Liberal-Conservative dimension and 95% CI are provided, as is one table. The table provides each representative's Lib-Con Score along with each representative's rank-ordered position on the Liberal-Conservative dimension, ranging from 1 (most liberal) to 149 (most conservative). For example, a representative in the More Conservative than 1/2 category possesses an ideological location and 95% CI which locates them at a position which is noticeably more conservative than 1/2 of their copartisans but not than 2/3 of their copartisans (that is, they are located on the conservative side of the party's ideological distribution and their 95% CI does not overlap with more than 1/2 of the members of the party's delegation, but does overlap with more than 1/3). Following this coding methodology therefore, a representative such as Tan Parker is coded in the More Conservative than 1/2 category because his Lib-Con Score and 95% CI results in him being significantly more conservative than 60 of his fellow 99 Republicans, a value which is greater than one-half of the delegation (i.e., 50), but less than two-thirds (i.e., 66). Similarly, a representative in the Centrist category is neither more liberal than 1/3 of his/her copartisans nor more conservative than 1/3 of his/her copartisans. It is important to keep in mind, that these comparisons are strictly focused on intra-party dynamics (i.e., within the Republican Party and within the Democratic Party), and, second, that for Republicans the term "Moderate" does not signify that the representative is "liberal", only that the representative has a voting record on the House floor that is more moderate than 1/3, 1/2, or 2/3 of his/her Republican colleagues. As the inter-party data clearly suggest, not a single one of the Republican House members is a liberal. It is for that reason that I use the term "Moderate" when discussing Republican representatives and "Liberal" when discussing Democratic representatives. By the same token, the term "Centrist" does not automatically indicate that a representative's ideological profile is moderate, rather, it indicates only that they occupy a position within the ideological center of their respective party. Both the figure for all 149 representatives (the Speaker typically does not cast roll call votes) as well as the table underscore the high degree of partisan polarization in voting on the Texas House floor. The least conservative Republican (Aaron Peña, R-Edinburg) is vastly more conservative than the most conservative Democrat (Tracy King, D-Batesville). This chasm between the Republican red and the Democratic blue is graphically displayed in the All Representatives figure. In regard to the Liberal-Conservative Ranking, the Texas House member with the most conservative voting record during the 2011 sessions is Ken Paxton, R-McKinney, followed by Bill Zedler, R-Arlington; Charles Perry, R-Lubbock; Jim Landtroop, R-Plainview; and Erwin Cain, R-Como. 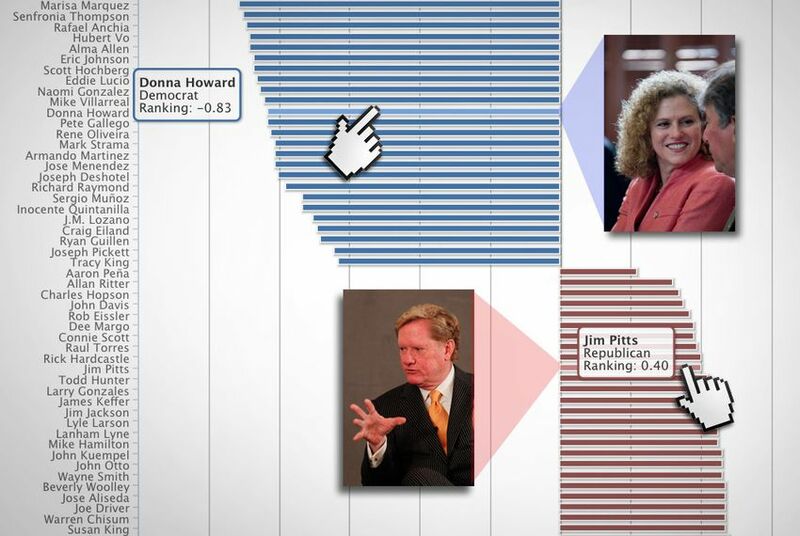 These five legislators represented the lower chamber's conservative extreme during 2011, with respective voting records that were significantly more conservative than 87, 84, 81, 81, and 78 of their fellow Republicans (99 total). At the opposite end of the ideological spectrum is Lon Burnam, D-Fort Worth, the House's most liberal member, followed by Roland Gutierrez, D-San Antonio. Burnam possesses a voting record that is significantly more liberal than 41 of his 48 fellow Democrats, with Gutierrez next at 35. Rounding out the top five are Roberto Alonzo, D-Dallas; Jessica Farrar, D-Houston; and Armando Walle, D-Houston. Within the Republican party, Aaron Peña stands out far and away as the delegation's most moderate member, followed by Allan Ritter, R-Nederland; Chuck Hopson, R-Jacksonville; John Davis, R-Houston, and Rob Eissler, R-The Woodlands. Peña has a voting record that is less conservative than every single one of his Republican colleagues, a fact best explained by his recent switch from the Democratic Party as well as the partisan profile of the electorate in his future district. Ritter and Hopson are also recent party-switchers, and like Peña have voting records which are significantly more moderate than an overwhelming majority of Republicans (87 and 85). Davis and Eissler also had voting records more moderate than most Republicans (81 and 79). While it is important to keep in mind that none of these five (or any other) Republicans can accurately be labeled as "liberals," it is the case that their voting records are significantly less conservative than most other Republican legislators. Within the Democratic party, Tracy King; Joe Pickett, D-El Paso; Ryan Guillen, D-Rio Grande City; J.M. Lozano, D-Kingsville; and Chente Quintanilla, D-El Paso, stand out as the most conservative House members. All have voting records which are more conservative than a vast majority of their Democratic colleagues (45, 43, 42, 41, and 41). King remains as perhaps the last example of the rural Anglo Democrat, which in the not too distant past was the dominant force within the Texas House. Lastly, while a great deal of attention has been focused on the Republican House freshmen and their impact on the House during 2011, there exists a considerable amount of ideological diversity within this group. While several freshmen were among the most conservative members of their delegation (i.e., Perry, Landtroop, Cain and James White, R-Woodville), an even greater number were among the Republican delegation's most moderate representatives (i.e., Dee Margo, R-El Paso; Connie Scott, R-Robstown; Raul Torres, R-Corpus Christi; Larry Gonzales, R-Round Rock; Lyle Larson, R-San Antonio; and Lanham Lyne, R-Wichita Falls). Mark P. Jones is the Fellow in Political Science at the James A. Baker III Institute for Public Policy, the Joseph D. Jamail Chair in Latin American Studies, and the Chair of the Department of Political Science at Rice University. This analysis is part of a larger report on the 2011 Legislative Session that will be published later this summer by the Baker Institute.